If you told the citizens of Pittsburgh, Pa in the 1970’s that the Steel City would eventually become a hockey town they may not have believed you. Western Pennsylvania has a legendary reputation for being football-crazed. There was a time when the Steelers were the only thing other than making steel that the city had to be proud of. The region was full of hard working people who loved to brag about their Steel Curtain. Pittsburgh does have a hockey history. It was home to the first professional hockey league anywhere in the world, the Western Pennsylvania Hockey League, which by 1902 was luring players from Canada, where professionalism was prohibited. And it is where the United States Olympic hockey team was born in 1920, when Roy Schooley, a Canadian who stayed in Pittsburgh, put together an 11-player squad that won silver at the Antwerp Games, in the sport’s Olympic debut. Hockey in Pittsburgh was dying in 2003. The Penguins organization was bankrupt and the team was struggling. Every good Pittsburgher knows the rest of that story about how Mario Lemieux came to the rescue. It’s a tale not unlike like the Legend of Paul Bunyan; it gets more fantastical every time it’s told. It’s the story of hockey great, Mario Lemieux who conquered cancer only to be failed by back pain so terrible he had to have help tying his skates. Lemieux retired from the game he loved in 1997 (the first time) The mismanaged Penguins at the time were so far in debt that they were unable to pay star players and asked them to defer their salary to keep the team afloat. 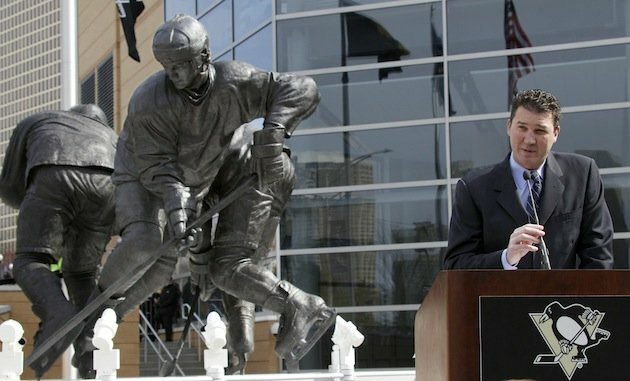 Years of deferred salaries, adding up to $32.5 million, had made him the Penguins' largest creditor. Lemieux stepped in with an unusual proposal to buy the team. He proposed to convert $20 million of his deferred salary into equity, enough to give him controlling interest. He also promised to keep the team in Pittsburgh. Since that time, hockey in Pittsburgh under the watchful eye of Lemieux and company, has grown by leaps and bounds. During the 2004-2005 lockout the Penguins received a gift -- The first overall draft pick. Wisely, they chose Sidney Crosby. His story is another chapter full of twists and turns in the story of hockey in Pittsburgh. Crosby brought the eyes of the hockey world to southwestern Pa. His success did more than generate new fans and sell out every game for the last six years, Crosby and the Penguins are committed to growing hockey in the region. 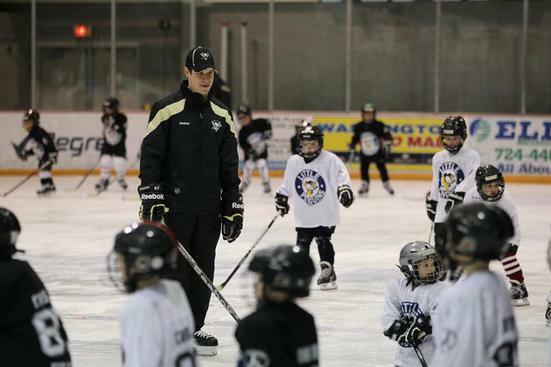 Crosby and the Pens sponsor Sidney Crosby’s Little Penguins. One thousand kids, aged 4 to 8, who every year for the past four years have received full hockey equipment paid for by the Pittsburgh Penguins, their 25-year-old captain and several sponsors. It was a way to both give back to the community and grow their fan base. (Mirtle) The team also supplies free sticks to every elementary school in the region and has begun constructing ball hockey facilities. The same region of Pa that turned out NFL greats Joe Montana, Joe Namath, Johnny Unitas and Dan Marino has turned out RJ Umberger, Dylan Reese and Ryan Malone. They’ve bred up and comers like John Gibson, J.T. Miller, Riley Barber, Vincent Trocheck and Calder Cup finalist Brandon Saad. 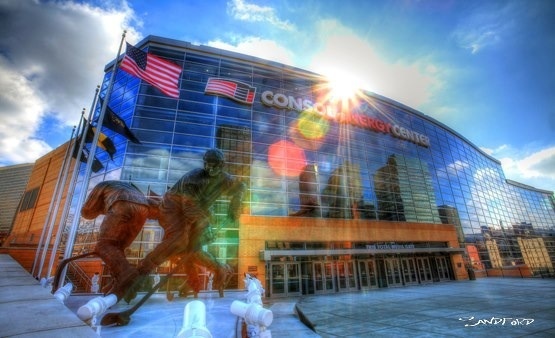 Robert Morris is making a name in NCAA hockey and hosted the Frozen Four this year at Consol Energy Center. All of this serves as evidence of hockey's strengthening foothold in western Pennsylvania, one that could one day soon rival the hotbeds in places like Detroit and Minnesota. 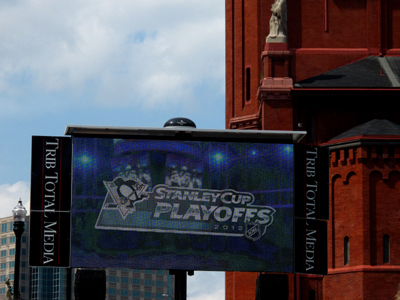 What makes Pittsburgh a hockey town? Mario Lemieux did when he invested his life in the city. Sidney Crosby did when he invested his time, talent and vision in the youth of the region. The investors in Consol Energy Center did when they believed in the Penguins enough to build a bright, beautiful barn. Most of all, the people of Pittsburgh made it a hockey town with their support and commitment since the ’05 lockout and into the future.